A 7-year-old singing prodigy is now known nationwide after her incredible performance of the Star Spangled Banner, before a crowd of 25,000 soccer fans at the Stub Hub Center in Los Angeles, California. Believe it or not, Malea Emma Tjandrawidjaja started singing when she was 1 year old, even before she could speak! She’s a natural singer, a gift she humbly thanks God for. One can’t help but smile when Malea walks out onto the floor in her cute pink dress. Show host Strahan lifts her up onto the elevated stage so everyone can get a good look at this young star in the making. The audience “awws” at her adorable response. One can feel Malea’s bubbly personality as she speaks with such clear enunciation. Her young face radiates a joyfulness that is innocently pleasant and pure. A cute little video from six years prior, showing Malea singing as a 1-year-old, is then shown to the audience. In it, she holds a comb—an impromptu mic—and sings to a lamp, “because there was nobody watching yet,” she explains. Well, she’s made huge progress in six years—from a lamp to 25,000 spectators. Malea is on the road to success already! 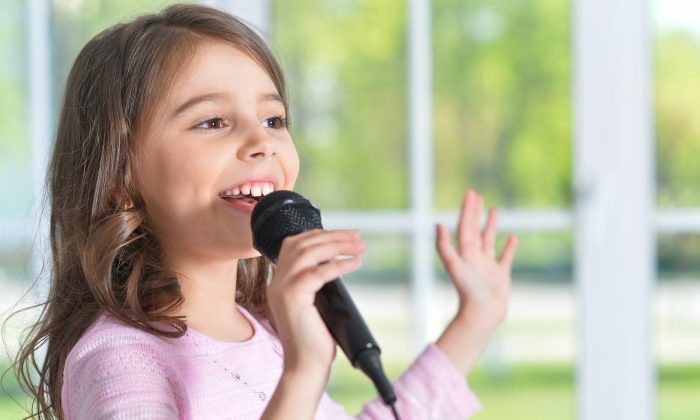 In addition to singing lessons, Malea loves practicing singing with her father. Her proud parents, together with her older brother, sit in the front row. To have such a powerful, melodious singing voice at such a young age, it’s no wonder she’s become an online sensation, with more than 47,000 Instagram followers. Malea tweeted back, expressing how happy, proud, and thankful she is to have received a tweet from Holliday. For Malea, it would be a dream come true to be able to sing with her idol. Well, both the audience and Malea were in for a big surprise. When the young singing superstar is invited to sing Jennifer Holliday’s “And I Am Telling You,” guess who joins her.